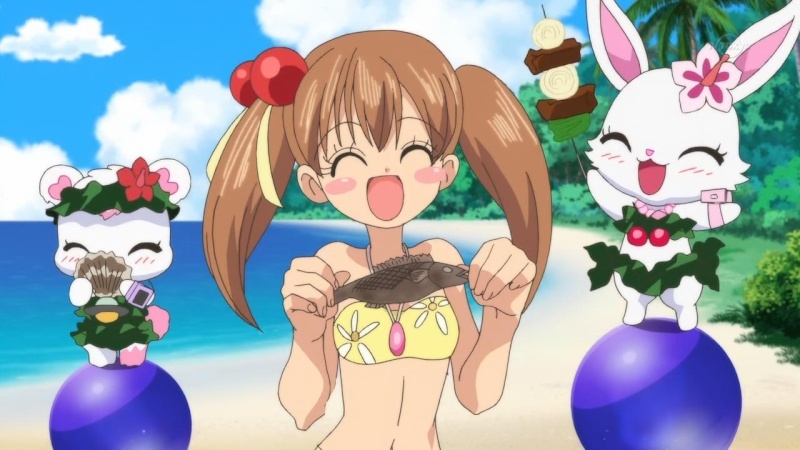 But jewelpet's always been a show that likes to resort to body humor (of boys and girls) once in awhile. I don't think I've ever herd of adult male otaku liking jewelpet (i'm sure they exist but) unlike Precure, so any sort of "sexual content" (and I use that word very lightly) is played just for laughs. The irony. Precure is the more squeaky clean in terms of content, but Jewelpet lacks the kind of action that brought the older male crowd to it. So have you watched any of these Jewelpet shows? I'm considering giving one a shot, either T/winkle, Happiness or this one. Each one is fine, some speak to me more than others, the hardest part is finding a reliable subtitle source. Some fansubs just gave up sometimes because their audience was too small - so there's multiple subbers some seasons. I think Jewelpet Tinkle would be a good starting point - the protagonist seems more like your type anyway.